Hibs today revealed that two of their most promising youngsters have agreed contract extensions. Scotland Under-17 internationalist Aaron Scott and Jordan Sinclair have penned deals which will keep them at Easter Road until the summer of next year, news which delighted boss Alan Stubbs. The head coach has already handed first-team debuts to Scott Martin, Lewis Allan, Kleton Perntreou and Conner Duthie during the course of this season and he’s promised Scott and Sinclair they’ll be offered the same opportunity if they continue to shine. Stubbs said: “There is a pathway through from the academy to the first-team squad and the incentives are already there for players to seize their opportunities. Scott (17), said: “I am delighted to get this contract extension. I joined the club in January and my aim was to play well enough in order to earn a longer contract. Sinclair, who has been with Hibs’ academy since Under-14 level, was equally happy. The 16-year-old, who has scored eight goals for the development squad this season, said: “This is exactly what I wanted and now I am aiming to work hard and continue my progress at the club. “Seeing the likes of Scott, Lewis, Kleton and Conner make their first-team debuts this season has been brilliant and I would love to do the same. Development coach Joe McBride believes both boys have earned their new deals – but warned they still have plenty of hard work ahead of them. 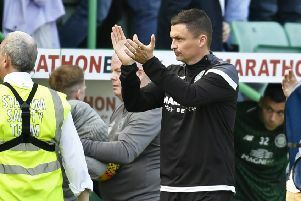 He said: “Both Aaron and Jordan have progressed well this season but they both realise what is required of them in order to continue their development at Hibs.